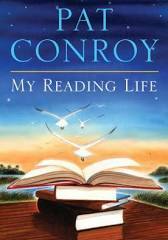 My Reading Life by Pat Conroy: A short review. I was fortunate enough to purchase a book signed by Pat Conroy, My Reading Life. I was so happy to obtain this treasure that I did not make write or underliome in it as I usually do when I read a book I really like. From my reading of this book this week, I learned so much about Pat Conroy, his travels, his literary and reading life, the people and authors and books that influenced him, about the act and art of reading, about how reading relates to one’s writing, and about myself. I had a true and womderful literary experlience in that reading. “Good writing is the hardest form of thinking” (304). “All writers are hostages of their own divine, unchangeable rituals” (206). “The most powerful words in English are, “Tell me a story . . . (303). “I learned how to be a man through the reading of great books” (321).